Our apartmentsResidents’ storiesWhere to apply for housing? Juha Kaakinen on the Finnish Housing First model. With the help of the programmes, organisations and municipalities have, for example, provided new housing for the homeless and reformed the services aimed at them. All of these actors have wanted the same thing: to humanise the life of the homeless. The state’s firm guidance turned reducing homelessness into a shared goal. The process went on despite the economic recession that began in 2008 , during which cuts were made to many other services provided by society. First and foremost, however, it all required a complete reversal in how homelessness was thought about: the whole system was built on the basis of the Housing First principle. Above all, Housing First is a principle. It is also an operating model, an ideology and a way of thinking. The Housing First principle is guided by the notion that having a place to live is both a human right and a basic right. All the work done for homeless people starts from the assumption that the first support measure should be the provision of housing. The work can be organised using different models and by providing different kinds of housing, but housing is always the top priority. As recently as the 1980s, a homeless person in Finland could only get a home once they had demonstrated their social acceptability. Often this meant abstaining from intoxicants. As a result, a homeless person would end up going round in circles with a permanent dwelling being nothing but a distant dream. In the Housing First model, a dwelling is not a reward that a homeless person receives once their life is back on track. Instead, a dwelling is the foundation on which the rest of life is put back together. When a person has a roof securely over their head it is easier for them to focus on solving their other problems. This shift in thinking particularly changed the lives of those long-term homeless people who had been in the most difficult position of all. This group includes people recovering from substance abuse and mental health issues, for example. Applying the model has reinforced the idea that they too can manage in a regular rental apartment if they receive the right kind of support. For one person, a lease and safe apartment of their own is enough support, whereas another may also need various support measures in daily life. The most important thing is that since 1987 about 12,000 people have received a home. Housing naturally cannot be provided unless apartments exist. It has been important for the implementation of the model that more affordable housing has come on the market. 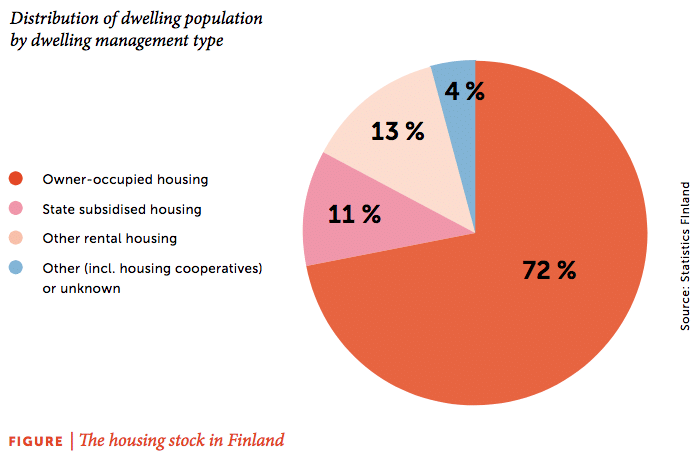 Constructing and purchasing new, affordable housing was one of the most important goals of the Finnish National Programme to reduce long-term homelessness (PAAVO I, 2008 –2011). Municipalities, cities and other organisations bought and built housing but the state also supported housing production. The Housing First principle produces results. In addition to benefiting individual homeless people, the principle benefits society as a whole. In Tampere, for example, the supported housing unit in Härmälä reached almost 250,000 euros in savings in one year thanks to the model. The savings in terms of the services needed by one person can be up to 9,600 euros a year when compared to the costs that would result from that person being homeless. Additionally, housing one longterm homeless person saves about 15,000 euros of society’s funds per year. The most important thing, however, is that since 1987 about 12,000 people have received a home. Over 60 percent of Finland’s homeless people live in the Helsinki Metropolitan Area. Since most work is available in the metropolitan area, migration is mainly directed towards it. Homelessness is also centred in other large cities. The vast majority of the housing stock consists of owner-occupied apartments, which not everyone can afford. Similarly, the structure of the housing stock does not meet people’s needs. In the metropolitan area in particular, homes being constructed are too large and too expensive in comparison to people’s needs. Finland has a social benefits system, which helps ensure that a person does not immediately end up on the streets after becoming unemployed or seriously ill. For instance, it is possible for people living in Finland to apply for social assistance or housing allowance. Health care is also free or affordable for everyone. The challenge with the forms of support is that a person has to know how to apply for the help they need by themselves. They might even have to apply for social assistance one month at a time, every month. The Housing First model in Finland has taken into account the existing social benefits system so that it is utilised as much as possible. Service providers help clients with getting access to assistance and services provided by the state or municipalities. The Housing First model is based on understanding homelessness extensively. So, it does not only apply to sleeping rough and it is not a problem that can be solved within just one sector. Having a broad definition of homelessness enables all the actors who the phenomenon concerns to participate in preventing and solving it. The actors usually involved are the state, municipality or city (and within it social security and/or health care, for example), companies, organisations, property companies, property owners and property developers. The actors vary according to how the services have been organised in each particular city. Defining homelessness in a broader sense helps recognize and consider all different paths that can lead to homelessness. A person can end up homeless due to several reasons, such as substance abuse or illness, for example. A homeless person may be a young secondary school student or an alcoholic senior citizen. Broadly defined homelessness is also easier to prevent than just street homelessness. 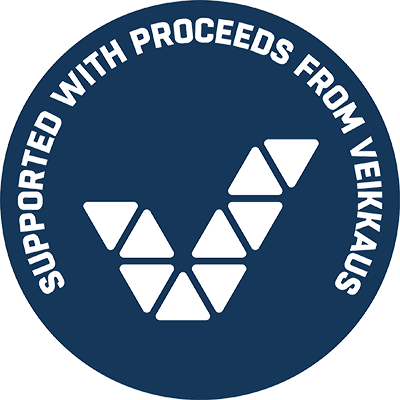 Since 2016, preventative work has been a specific emphasis in all work on homelessness in Finland, and cross-sectoral cooperation is the most effective way to do it. The goal of the Housing First principle can be summarised in two sentences: The services operating according to the Housing First principle do not want to get rid of their clients. Instead, the purpose is to provide clients with a permanent dwelling – that is, a home. The person who is homeless can go straight to living in a rental apartment without temporary arrangements. Health and social problems are addressed when housing is permanent and domestic peace is guaranteed. For some, the best model for independent living is an ordinary rental apartment, for others it is a supported housing unit where support is available around the clock. The client has the opportunity to choose from treatments and services. If the client does not want to completely give up intoxicants, they are not forced into doing so. Instead, a sufficient goal is to reduce the use of intoxicants and the harm caused by psychiatric symptoms so that they will be able to live in their home. The services supporting recovery are constructed so that they respect the autonomy of the resident and strengthen their participation. Staff meet and treat the client as an equal. Interaction with the client aims at building trust and an atmosphere of communality, which help the client to rehabilitate and empower themselves on their own terms. The aim of dialogue and interaction is always to find solutions to the client’s situation together with them. This requires stripping away the employee’s position of power and adopting a new approach to work. The resident is consistently given positive feedback on even the smallest of everyday achievements. In Housing First work, the resident gets help to make their dwelling feel like a home. A home is a prerequisite for the resident being able to organise their own life and to feel involved in it and their environment. Having their own lease, for example, creates a feeling of permanence and thereby helps to feel connected to wider society. The resident is supported in keeping in contact with immediate networks such as their family. In supported housing units, systematic neighbourhood work is done with residents. In addition to the aforementioned principles, a sense of community is also a strong guiding value of Housing First work in Finland. Many housing units have made the living community their starting point, involving and empowering the individual through a strong sense of being a member of a community. In services adhering to the Housing First principle, a homeless person refers to anyone who does not have their own rental or owner-occupied dwelling. Defining who is homeless is still difficult because people’s situations vary. At worst, a homeless person sleeps rough on the street. Many, in turn, live temporarily with their relatives or friends. 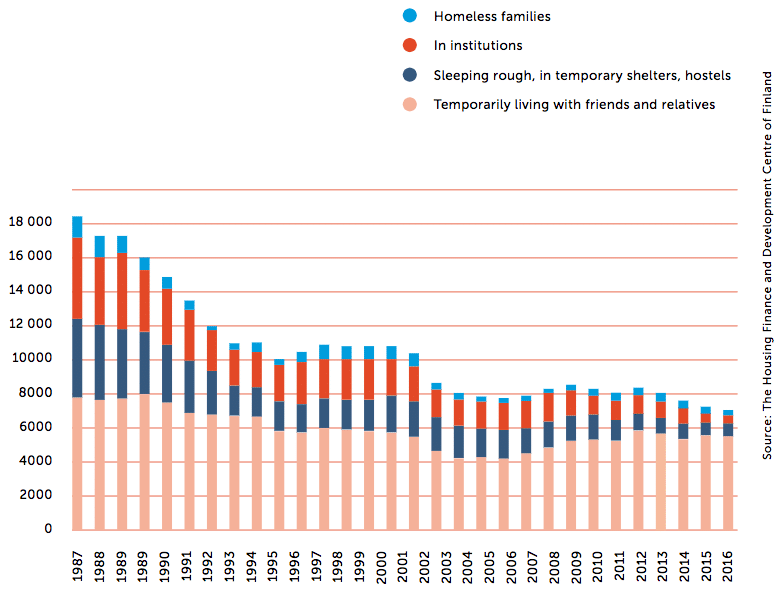 This kind of homelessness may not even appear in the statistics, in which case the phenomenon is called hidden homelessness. In Finland, the most comprehensive housing statistics are collected by The Housing Finance and Development Centre of Finland. Those living rough, in stairwells, shelters, etc. How does the Finnish model differ from the American Pathways Housing First model? The Finnish Housing First model was born around the same time, but separately from the Pathways Housing First movement that started in the United States. The models have two key differences: In Finland, the residents pay the rent themselves. Just like any other Finn, they can apply for housing allowance and other support if they are not capable of paying it themselves. In the United States, in turn, 30 percent of a resident’s income automatically goes towards the rent and the landlord or organisation that has arranged housing bears the responsibility for paying the rent. Another difference is in how support is arranged for the residents. Unlike in the United States, in Finland a large multi-professional group is not automatically put together beforehand for treating a resident. Support is instead offered for residents according to their needs, making use of the services that already exist in society. This is possible due to the high standard of social and health services. This article was first published in our book A Home of Your Own (2017). Miten Suomessa asutaan? Omistusasuminen korostuu tilastoissa. Lähde Tilastokeskus.